SPECULATION: Have we really seen Necrozma's "true" form? A long, extensive analysis. Hello all. I've recently been playing through Ultra Moon, and got to the Ultra Necrozma fight the other day. There is something on that subject which has been on my mind for quite some time, that I can't really make heads or tails of, and that battle brought my questions back up to the surface. USUM have been out for some time now and I feel as though most people have digested them, but before the next games roll around, I'd like to collect some thoughts about this. So, it's pretty commonly thought that Ultra Necrozma - the big, luminescent, dreadfully powerful form of Necrozma that we see during the climax of the story - is the very same appearance that Necrozma bore in the distant past, before it was exploited and wounded by the people of Ultra Megalopolis. Its "true form," to put it simply - what the Ultra Recon Squad tell us was once revered by their ancestors as "the Blinding One." And this is certainly easy enough to assume based on the presentation in the games alone... after all, it's a giant dragon made of white-hot light that radiates auras of great power. "The Blinding One" is a most appropriate epithet for such a creature. Indeed, I myself finished up USUM the first time with this very impression in mind. But there are some pieces of evidence I came across later that caused me to doubt that impression. But let me first lay out what I believe to be the basic, linear history of Necrozma according to a handful of scattered in-game quotes. Phyco: Our Ultra Megalopolis was once a world filled with light... Necrozma was called the Blinding One, and it gave us all the energy we needed. And in fact, we were not the only ones who basked in its light. It traveled even to the distant world of Alola by passing through the Ultra Wormholes! Dulse: So this is Tapu Village! We will need to investigate it quite thoroughly. According to the records we have left to us, it seems that this is where Necrozma battled against the tapu when it came to Alola long ago, hungering for its light. It may be the case that the power which came pouring out of the Ultra Wormhole at that time is what changes Pokémon's regular moves into Z-Moves. Such theories have been suggested... Our ancestors were greedy, and they sought to control all of Necrozma's light... But what was the result of all that? They only hurt Necrozma, making it lose a part of itself and causing it to run wild and steal all the light it could find! Hidden library document: The pillager of light descended from the sky and shrouded the world in darkness. The pillager took from us the beast that devours the sun/calls the moon, using the beast as its own Dusk Mane/Dawn Wings. A youth and the guardians together used the stones to summon the light once more. The beast that devours the sun was freed/parted from the pillager of light, and the darkness was banished from Alola. Kukui: Sure! A long, long time ago, Alola was cloaked in darkness, yeah... But people say that's when Alola's people and Pokémon blasted all that darkness away with light! And they also say that was why people started gathering Z-Crystals, and that custom turned into the island challenge. Soliera: Before our ancestors were forced to contain it, Necrozma emitted powerful light... That light is what you call auras! So let's combine these accounts. Long ago, Necrozma shared its light with the people of Ultra Megalopolis. Those people eventually became greedy and tried to control all of Necrozma's light, but in doing so, they hurt Necrozma and made it "lose a part of its body," at which point it began to run wild, and stole the light from Ultra Megalopolis, plunging it into darkness. Necrozma then ran away to Alola, thirsting for even more light, and fused itself with Solgale Lunala. It did battle against the tapu, but they combined their power with that of a youth using "the stones" (I'll come to that) and broke Necrozma's fusion, thereby returning the light to Alola and driving Necrozma away. In Alola, this is the point at which people began to gather Z-Crystals, and as for Necrozma, it seems to have been banished back to Ultra Megalopolis, where the people "were forced to contain it" and suspended it in Megalo Tower in order to keep Necrozma from rampaging even further. Pretty simple so far, yeah? And in the present time of the games, we are told that Megalo Tower's power is beginning to wane after many long years of containing Necrozma, and that Necrozma will soon break free and return to Alola in another attempt to consume its light. This comes to pass, and Necrozma again fuses itself with Solgale Lunala, and then flees to Ultra Megalopolis after a brief skirmish. We're told that the light Necrozma has stolen from another will allow it to regain its "true power," but since Necrozma is in a "broken form," it can't control that light and will only suffer even more. We can clearly see that it is pained atop Megalo Tower, and it seems to reach a breaking point, at which its prism brain ejects from Solgale Lunala's head and erupts with light, forming Ultra Necrozma. But that's what I'd like to talk about. Was what we saw there really Necrozma's true form? Or was it perhaps a form that Necrozma was never meant to take? Iwao: I dug into the original setting in my own mind, reconstructed it, and gave Necrozma, Solgaleo, and Lunala this deep relationship. Necrozma can control light, but it cannot create light. So it has a strong desire to steal the light from Solgaleo and Lunala, which both possess their own light. These three are always struggling against one another in Ultra Space. Necrozma might steal the light of the others and flee, then Solgaleo and Lunala might give chase and take the light back — and on and on it would go. They had always lived this way, but the balance of this relationship among them was thrown off due to the interference of the Ultra Recon Squad in Necrozma’s world and the people living in Alola, like the protagonist. As a result — and even though it really only ever needed a small amount of energy — Necrozma comes to gain a huge amount of energy, beyond what Necrozma itself anticipated, when it captures Solgaleo or Lunala. And because of gaining this excessive amount of energy, Necrozma goes berserk. That is what we call "Ultra Necrozma." And we wanted to depict the drama of the hero encountering this Ultra Necrozma at the climax of the story. It was the actions of people that made Necrozma run amok, but in the end, it will be caught by the player and join them as an ally. Thanks to that, Necrozma will become able to draw forth its own true power once again and be able to accompany the player on their island challenge, without needing to target the lives of Solgaleo or Lunala. We wanted to illustrate how the relationship between Necrozma, Solgaleo, and Lunala, which had been destroyed in the past, is forged again by the hero’s actions and the balance of the world is restored. This quote, to me, seems to describe a relationship that is quite complex and very different from what we were shown in the games, where the relationship between Necrozma and Cosmog's evolutions seemed to fall upon mere coincidence (they create/draw in light, which just so happens to be what Necrozma needs after it lost its own light...). Here, it seems as though they had "always" been embroiled in a sort of perpetual predator/prey relationship. Furthermore, it seems that Necrozma and the Cosmog line are the only Pokémon that can willfully open Ultra Wormholes, and indeed, they both share many traits with the Ultra Beasts despite not being explicitly classified as UBs themselves (the games continually beat around the bush whenever it comes to their UB status). But I must say that I find it hard to envision the relationship described by Iwao above as something that unfolds between Solgaleo, Lunala, and the big light dragon that is Ultra Necrozma. It just seems fairly incongruous, for a being of such power and radiant light, to have to pursue these other, weaker beings of light in order to sustain itself. And what would happen to it when Solgaleo and Lunala "took the light back"? Would the light that composes its body dissipate? It is perhaps easy to assume so, but that sounds a lot like what we know would eventually happen to Necrozma on Ultra Megalopolis, and it seems strange to me to suggest that Necrozma would have been reduced to a "broken" form multiple times. Ultra Necrozma's bio: Ultra Necrozma is a further transformation of Dusk Mane Necrozma or Dawn Wings Necrozma, the forms that Necrozma takes when it captures Solgaleo or Lunala. It is a new form that even Necrozma had never taken until now. It has been discovered for the first time in the form of this dragon brimming with light. "A new form that even Necrozma had never taken until now." "Discovered for the first time." Hmm. Now, not to jump the gun - it is possible that these lines are meant to be read as metafictional, as in, Necrozma had never taken this form until now, in the games Ultra Sun and Ultra Moon, rather than saying Necrozma had never taken this form until the events of Ultra Sun and Ultra Moon. Perhaps they didn't want to spoil Necrozma's lore, about having once lived as Ultra Necrozma until it was wounded by the Megalopolitans. But I looked at all of the other Pokémon bios on the site, and all of them were written from an in-universe perspective, describing the natural behavior or qualities of the Pokémon in question. Except, perhaps, for Naganadel, which notes that it is the first Ultra Beast to have been found to evolve - which may be true within the story, unless the plot-reveal of Cosmog being a suspected UB is meant to be taken at face value. In which case, perhaps they are also just protecting that spoiler... but given how the USUM site freely spoils other SM plot developments such as Solgaleo and Lunala evolving from Cosmog, I have my doubts, especially since it still isn't totally clear as to whether or not Cosmog and its evolutions are truly considered UBs anyway. Pokédex: This is its form when it has absorbed overwhelming light energy. It fires laser beams from all over its body. But again, there is some frustrating room for ambiguity here. Is it saying that Ultra Necrozma is a form that Necrozma takes only upon absorbing "overwhelming" light energy, and that the form wouldn't exist in any other circumstance? Or is this written in the context of Necrozma's already fundamentally altered existence... as in, the only way it can take this form nowadays, after being broken, is by absorbing overwhelming energy? To put it another way, hypothetically, would Ultra Necrozma have had a different Pokédex entry if it were documented in the distant past, when it was a complete being? Speaking of Necrozma being an "incomplete being." We're told a number of times that it "lost a part of its body" when the Megalopolitans tried to control its light. But what body part was this? My first thought that that it was simply, well, the light - the stuff that makes up the draconic body as Ultra Necrozma, leaving behind the armor pieces to assemble into the darker Necrozma that we've always known. But there is a scene in the post-game, in which Kukui and Lillie posit a theory about the origin of Z-Crystals and Sparkling Stones, which could suggest differently. Kukui: It all starts with your Z-Power Ring, yeah, forged from the Sparkling Stone you got straight from Tapu Koko! When you use your Z-Crystals, it brings you and your Pokémon together! Lillie: Yes, it seems that some sort of invisible bond is created between a Trainer and their Pokémon. Kukui: Yeah, a Trainer sends their physical and mental energy, and their Pokémon are surrounded by an aura! Lillie: So, what is it that allows a Trainer to send their power to a Pokémon? Kukui: Yeah, it's that Z-Power Ring, made from a refined Sparkling Stone, that changes a Trainer's power into light and gives their Pokémon an aura! Kukui: That's an important point! Could Sparkling Stones have also come through the Ultra Wormhole and landed here in Alola? Lillie: Long, long ago, Necrozma lost part of its body -- at least that's what the Ultra Recon Squad said. Lillie: The Sparkling Stones themselves might be that part of Necrozma's body that it lost! If that's the case, then Necrozma... When it's with you, [player], it can get back that part of itself that was once lost. Kukui: It might just be a theory, but you are one awesome Trainer, [player]! Lillie: And Necrozma, in its own way, is an awesome Pokémon! Hee! Kukui: I heard about it from Colress, yeah... He told me you can give Solgale Lunala's light to Necrozma! Lillie: Yes, and then Necrozma can change back into that brilliant form! Kukui: I've heard old stories about how Necrozma was driven back by the light, but maybe people were just giving it the light it needed. This dialogue here is what made me think that maybe the "part of its body" that Necrozma lost wasn't just the light-dragon part of Ultra Necrozma, but rather, that Necrozma once had a whole body composed of the crystalline material that forms Ultra Necrozma's face, breastplate, and limbs. (Not that Pokémon isn't above some kind of bizarro science in which light can turn into stones - indeed, the in-bag item descriptions for the Z-Crystals say that they are a "crystallized form" of Z-Power, but I doubt that Game Freak intended for us to have an item description, of all things, in mind when parsing this scene, and I would say that Kukui seems to be talking about the stones coming through the wormholes as physical objects, not light.) Perhaps this other form was more on the power level of Solgaleo and Lunala rather than far exceeding it... maybe it had the standard 680 BST, and by fusing with Solgaleo or Lunala in modern times, Necrozma recoups that loss by using them to "fill in" for the missing part of its body. And perhaps this earlier form was one in which the pieces that Necrozma's concept art labels as its "arm(s)" were indeed still the arms, and its "tail" was actually a tail. Phyco: Necrozma took on that brilliant form once again and became Ultra Necrozma, thanks to you all. But now... Necrozma has lost its light once more and appears to have fled to Alola. Dulse's dialogue is a bit more flexible, as he seems to be coining the term "Ultra Necrozma" on the spot, and merely says that it shone with blinding light *as* it used to, which could just be comparative. But Phyco's line is pretty difficult to read as saying anything other than "Necrozma used to be in that form, and just took it on once again." I've considered that maybe "that brilliant form" it "took on once again" may simply be referring to the prism brain that was filled with light, since he does follow that with "and became" Ultra Necrozma, but that feels like a stretch compared to the more straightforward reading. I suppose it's possible that the modern Ultra Recon Squad may not have ever actually seen a depiction of what Necrozma looked like in the ancient past, and therefore just assume that Ultra Necrozma is it, but it seems like something should have been mentioned about that if that were the case. And... there's a part of me that can't shake the feeling, that Ultra Necrozma is what we're supposed to have in mind when they talk about "the Blinding One." As I said at the beginning of this piece, it's a very appropriate descriptor. You see a giant dragon made of photons, you're told it was once called "the Blinding One"... it's not hard to connect those dots. So. If you've actually managed to read this all the way to the end, I thank you for your time and your patience, and I ask, what are your thoughts? Do you find the evidence I've compiled to be persuasive? Did Necrozma once have an unseen, "true" form, with Ultra Necrozma being some kind of overcharged form that happened by accident? Did they pull another "original dragon" on us? Or do you think that "Ultra Necrozma" is pretty clearly the "Blinding One" that's talked about, and I'm just massively overthinking everything? Please let me know! Well, if Necrozma had successfully chased Solgaleo and Lunala before it was caught by the Ultra Recon's ancestors, wouldn't Ultra Necrozma be perceived as the Binding One? Why would it have chased them had it already had a powerful form? Greed? I am confused as to what another form would explain or add. This gives me bad memories of the Infinity Energy discussion that followed ORAS. I feel that Game Freak don't have a solid grasp of this kind of lore. But then as you say, why would Ultra Necrozma be chasing Solgaleo and Lunala around? It looks like it’s got all the light it needs, and it’s much more powerful than them. Greed doesn’t seem to fit, since Necrozma back then is primarily characterized as sharing its light with people. It feels like Iwao isn’t even talking about the same game, to be honest. Is it possible that the people responsible for writing the story might have diverged from his vision? ‘Cause none of what he mentions ever came up during the plot of USUM, which made it seem like a really straightforward case of, “Necrozma used to have light (as Ultra Necrozma), then it got hurt, lost that light, and now what remains of Necrozma tries to steal all the light it can find. By merging with Solgale Lunala, it obtains enough light to recreate its original form.” Although that, in turn, left the role of Solgale Lunala and their relationship with Necrozma extremely vague to the point of seeming incidental. I am confused as to what another form would explain or add. Nothing in particular - I myself am not even terribly interested in the hypothetical “unbroken” form (even if it ever existed, it’s never coming back because its shards would have become the Z-Rings and Z-Crystals, and there’s no way it’s getting those back) so much as I am in clarifying where exactly Ultra Necrozma is supposed to sit in this scheme of things. The reason why I proposed the existence of a different form is simply to answer the question of what, if not the Ultra Necrozma that we see, the characters are referring to when they talk about Necrozma in the past. I doubt it would have simply been the standard black Necrozma that was first introduced, because it has to lose some part of its body upon being abused by the Megalopolitans. It’s not entirely clear if that’s meant to be interpreted as some physical component of a form we’ve never seen which physically shattered into the Sparkling Stones and Z-Crystals, or just the light that composes the draconic body of Ultra Necrozma which then somehow would have turned into those stones and crystals. Iwao and the official site make it seem like the latter, but that’s not the impression that I got from the game on its own, and I don’t think most other people did either. From what I’ve seen from fans, Ultra Necrozma seems pretty firmly regarded as Necrozma’s original form. It is not unthinkable that Iwao had to sacrifice some of his vision (to make Necrozma nicer, perhaps) and that interview was his way of telling his version. Maybe it can fuse with both legendaries for a "true form"
That isn't what Esserise is getting at. I think this is a really fun topic of discussion! Maybe Nebby is much stronger than the other Solgale Lunala because of its bond and friendship with Lillie and the player, and Ultra Necrozma appears stronger because of that. Another option is that Necrozma has not become Ultra Necrozma in a veeeeeery long time, and forgot how it worked, turning "berserk". The Radiant stones part is very interesting, through. I'd assume they were just small parts of Ultra Necrozma's wings and chest, instead of being a part of something completely different. I also loved your theory about the UBs. Does this mean that UBs will be created in the normal world now? Maybe Stakataka and Blacephalon are the first species to be created this way? They are based on human objects after all and don't seem to have a world... (Xurkitree, Celesteela and Kartana too, but Xurkitree is a tree that happens to look like cables, Celesteela is a bizarre merging of a rocket and a bamboo tree rather than an alive object and Kartana's world has its own humans). Well, the anime clears that the Ultra Necrozma form as we know it now existed earlier, too (and is not a new occurrence) since Ultra Necrozma appears in ancient paintings in a scene. Phyco, at Ultra Megalopolis in Ultra Sun: Now that it has found a source of light, Necrozma will regain its true power. But it cannot control its own light in the broken form it was left in after it lost a part of itself. This power will only bring Necrozma more pain. Dulse, at Ultra Megalopolis in Ultra Moon: Necrozma will reclaim its true power, now that it has stolen the light from another. But it cannot control that light, and so Necrozma only suffers more. Phyco, at Tapu Village in Ultra Moon: The Blinding One may run wild in its fury, but it did also give us light once. So we would like to help restore the Blinding One to its true form. But we do not have even the slightest idea of how we can do that. Dulse / Zossie at Route 1 in Ultra Sun: Though the Blinding One is left in such a state now, so dark and enfeebled... / We’ve just gotta make sure the Blinding One can shine like it used to again, right! So let’s get started by having a look around! In-battle message after activating Ultra Burst: Necrozma regained its true power through Ultra Burst! Additionally, Ultra Necrozma’s Pokédex entry in Ultra Moon talks about how the light pouring from its body affects nature and living things in various ways, which is certainly a trait that its light had in the past (influencing the emergence of trial sites and Totem Pokémon, and presumably the UBs as well). However, it probably can’t be discounted that even if Necrozma had a different form in the past, Ultra Necrozma’s light simply retained that trait. I too considered the possibility that there could be a different history for each version, but as you say, that would probably be too complicated, and I think it’s pretty clearly not at all what the creators were trying to suggest, even if what they were trying to suggest is a little muddled. The biggest reason why I’m so hung up on this is because I’ve always loved the idea of a climactic Legendary Pokémon that is new, and created for the first time during the story. If I’m reading Iwao’s quote correctly, and if Necrozma’s site bio isn’t just avoid spoilers by speaking generally, then Ultra Necrozma would seem to fit the bill... but I admit I don’t love the idea of another Original Dragon situation. I didn’t mind it in Gen 5 because the OD was clearly and unambiguously the true, “ultimate” form of the three dragons, but I think this here with Necrozma would essentially just be a clerical formality rather than anything particularly compelling. Ultra Necrozma being the original form may not be a realization of that concept I’ve been interested in seeing, but it’s a more straightforward answer in this particular instance. However, it’s not easy for me to ignore these odd counterpoints that have come up. Perhaps so. Another possibility I’ve considered is that if Ultra Necrozma was the original form, then perhaps it had a lower BST at the time, and the only reason it sits at the extreme 754 it does now is because it’s recreating that form with Solgaleo or Lunala’s power rather than existing “purely” with its own light. And when it does this on its own, during the climax, it is completely unsupported and can’t control that power (maybe that’s the reason it gains a boosting aura in Ultra Megalopolis, as well - the power is going further out of control). But with Colress’s machines, you can awaken Necrozma’s hidden potential, which gives it the willpower needed to fully and safely wield the light of Solgaleo or Lunala. That’s certainly possible, although personally, the image looks a bit odd in my head. (But I guess if you think of them as “scales” on the dragon, it’s kind of neat.) In any case, there must be a lot of Z-Rings and Z-Crystals in the world, so if they were originally a physical part of Necrozma’s body (whether that was Ultra Necrozma or an intermediate “standard” form), it must have been a pretty significant part. 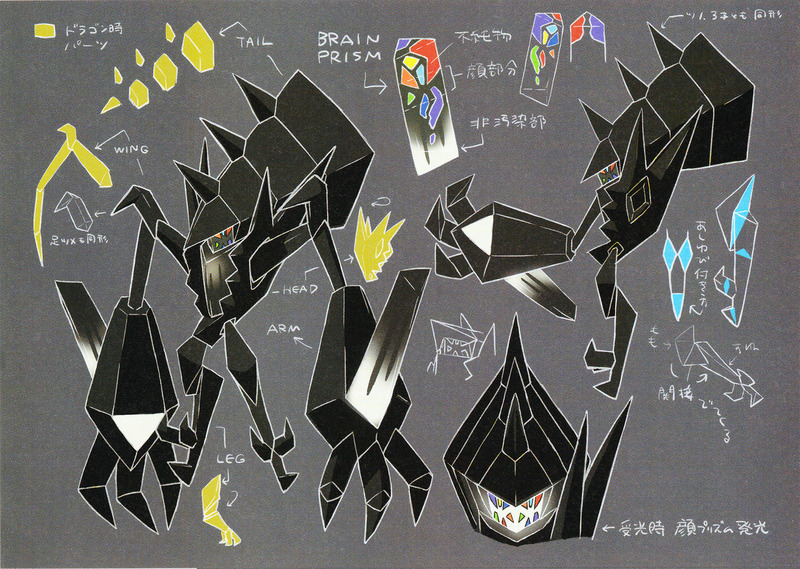 Incidentally, if the Stones and Crystals were originally just the light energy part of the dragon body that somehow changed into a solid form after passing through the wormholes, I think that would definitely fit the bill of “a pretty significant part,” and it would explain why those specific pieces that were left behind to form the black Necrozma were the pieces left behind - because the part of its body that became the Z-Gadgets was the light that filled in those pieces. I wonder if Necrozma and Ultra Necrozma were designed simultaneously? Looking at the black Necrozma, it’s clearly made up of broken dragon pieces. But was Ultra Necrozma what they always had in mind as the “proper” arrangement of those pieces? I know that Hitoshi Ariga had a hand in the design of Ultra Necrozma, but I wonder who else was involved and who designed the black one. I think Blacephalon and Stakataka do have their own worlds - we’re just not able to visit them because GF didn’t want to give us an infinite supply of the new UBs, and probably also wanted to retain some aspects of the UB missions from SM. They definitely came through the Ultra Wormholes to arrive in Alola, as we see during the climax when Dusk Mane/Dawn Wings opens up wormholes all over the region and Blacephalon/Stakataka descend in front of Hala and Hau. It seems that in the regular world, Necrozma’s light forms Totem Pokémon instead of UBs. Why exactly that would be the case isn’t clear. Maybe it’s because the Pokémon world already had complex life living in it, which became affected in the areas where the light auras were the most potent? Whereas, I’ve always thought that most of the UBs looked like they formed out of their own environments. The crystalline pillars in the Ultra Deep Sea look like jellyfish polyps that could develop into Nihilego, the Ultra Plant is filled with giant Xurki-trees (I’d point out that it’s not clear whether those are actual Xurkitree that have grown to incredible sizes, or if they’re just examples of that world’s plantlife that Xurkitree have taken on a similar appearance to). Celesteela and Kartana are perhaps the most blatant examples, as we see Celesteela growing from the grounds of the Ultra Crater like bamboo, and can see Kartana-shaped blossoms on the trees in the Ultra Forest. So perhaps the presence of Necrozma’s light in the UB worlds enriched the environments and made them capable of supporting life, albeit very strange life. And perhaps the thing that separates UBs from regular Pokémon is in how they breed. Regular Pokémon rely on eggs when reproducing, and even the highest echelons of Legendary Pokémon have had their beginnings associated with eggs. Whereas, Nihilego might breed like regular jellyfish, and that’s one reason why they’re considered so unusual. Likewise, if Solgaleo and Lunala are, in fact, Ultra Beasts, then we have seen with them that they also circumvent the use of eggs, and just create new Cosmog from nothing. Perhaps the first Cosmog were born as a result of Necrozma’s light, too. I have looked into that, but as usual, the anime’s lore takes some big departures from that of the games, so I don’t think it can be relied upon for much clarity in this matter. Remember, the anime is the same source that had Mewtwo able to Mega Evolve without any Mega Stone, and Kyurem able to change forms without laying so much as a finger on Reshiram or Zekrom. @Esserise Weren't the Kyurem fusions new in B2W2? Same for the midway fusions in USUM, maybe. ... which is, amusingly, what we did end up getting with Dusk Mane and Dawn Wings, but story-wise, those must have existed at least once in the past, when Necrozma came to Alola and battled the tapu, because the hidden library page mentions them. The thing is that treating Ultra Necrozma as a brand new form would also defeated by all this lore about yet another form. It makes more sense to allude to an unseen stronger form than a weaker one, from a mystery perspective at least. Anyway, there is a general problem with legendaries in that the ones that get any role always fulfilled some role in the distant past that is largely repeated in the present. Mewtwo would be an exception if it had a role to speak of. What I like about Ho-Oh and the legendary beasts is that their lore explains what they're doing in the present, but they aren't retracing their steps. I agree that it makes more sense to hint at unseen stronger forms rather than weaker ones, but in this specific case, the way that Ultra Necrozma comes into being kind of requires that there be a weaker (but not as weak as the “broken” Necrozma) form in the past, if their intention is indeed to suggest that Ultra Necrozma is a brand new form. Necrozma would need to have existed in a reasonably powerful “default” form, which then gets broken by the Megalopolitans, leaving it in the black form that we encounter in SM. That form is characterized as being in constant pain and starving for light because it lost a part of itself, and as a result, it seeks out light from other sources, which leads it to Solgaleo and Lunala. But those end up being far too potent, and when it tries to fuse with them, it explodes into a new, supercharged form that even it wasn’t anticipating. There’s no particular need for us to ever see that “original” form since that’s all ancient history, but it would need to have existed in order to facilitate the chain of events that lead to the overpowered form’s genesis. And it makes sense with the lore about Sparkling Stones, because if those are physical fragments of this “original” Necrozma, then returning to that form is a lost cause, which emphasizes the extent to which the “original” form is not need-to-see information. The problem is that I can see it making just as much sense to say that it was simply a matter of Ultra Necrozma existing back then, full of its own light, and then the people tried to harness all of that light which caused something in Necrozma to become unstable. That resulted in Ultra Necrozma’s light energy body dispersing and passing through the wormholes to somehow become Sparkling Stones in Alola, leaving behind only the prism armor and the brain, and nowadays, Necrozma just wants to find a source of light that can restore it to the form that it once existed in naturally, which Solgaleo and Lunala just happens to be sufficient enough to do. I do agree with that, for the most part. In fact that’s probably why I think the interpretation of Necrozma as a new form is more interesting than the interpretation of it simply returning to its original power and state of existence. Not only because Iwao’s description of the Necrozma/Solgale Lunala dynamic is clearer and more intricate than “they’re just coincidentally a good light source that happen to be another key part of the plot as well,” but also because, under that reading, what happened in the past was one thing, which leads directly to new, different events in the present that nobody could have anticipated. I also think it engages with Necrozma in a more unique way - instead of just being a total rehash of Kyurem, Necrozma’s own desire to restore itself gets it caught in a situation where even it loses control and gets more than it bargained for. Almost as a parallel to the very same Megalopolitans who tried to take all of its light and ended up suffering disastrous consequences. The motives are different (Necrozma’s hunger and desire for pain relief compared to the Megalopolitans’ greed), but both situations play with the idea of giving in to temptation and then losing control. And it was mine as well, when all I’d done was play the game and read the text files. But then the guidebook quote and the site bio came along and messed that all up. But I suppose there is an argument to be made that stuff like that isn’t as canonical as information from the games themselves; Death of the Author and all that jazz. So if there are contradictions or if there is some kind of controversy, it would be safer to err on the side of the games. I don't think we've ever had a quote expand or contradict in-game lore before. Maybe Iwao really is unruly. As far as the site bio goes, I'd look at the Japanese version before using it as evidence. Maybe the quote wasn’t translated completely accurately? Another oddity is that it seems to credit the URS and “the people living in Alola, like the protagonist,” of all people, with the disruption of the trio’s relationship. But that all would have happened centuries ago, long before any of those characters existed. That being said, I think they actually have expanded on a couple of things in public statements before. Specifically, Masuda gave out some extra pieces of information about both N and AZ during their respective generations. That’s how we know N’s full name, which never comes up in the games. Similarly, I also remember the ORAS site going into a tiny bit more detail than the games did about the clash between Primal Kyogre and Primal Groudon, about how their battle was waged for 40 days and 40 nights (or something like that). Very likely Necrozma had absorbed so much sunlight in its another universe, so it was a benevolent deity that gave light to people there, but the greedy people abused it, lost its body part as well as losing the light, turning it berserk and fled to Pokémon World trying to regain sunlight. However its fusion with Solgale Lunala didn't get enough light and still had to rely on sunlight in planets so this is why it was gone berserk, until the Pokémon trainer finally managed to capture it due to partial sunlight absorption. The "unseen new form" of Necrozma is actually Ultra Necrozma but it refers to how people of Pokémon World haven't seen this form, even Lusamine herself. To regain light fully, it needs longer time of (or high amount of) sunlight (or artificial light if applicable) to replenish that. The Ultra Burst also relies on sunlight, so as its Z-Move "Light That Burns The Sky". That means, Necrozma needs solar-based energy to work properly or it will gone berserk.